At Mr. Transmission Milex, we understand that the brake system is one of the most important safety systems in your vehicle. Because of this, keeping up with brake repairs and maintenance services is critical to your safety on the road. The brake system is comprised of many components, including brake pads, cylinders, drums, and rotors. These components all endure wear and tear with miles driven and will need replacement and maintenance at some point. If you are diligent with your brake system maintenance, you can hopefully prevent the need for major brake service repairs. Milex offers a road-ready Performance Check, where we will inspect your brake system for any needed maintenance or repairs. Maintenance may include flushing and filling of the brake hydraulic system and brake pad replacement. Brake repairs may include replacement of hoses or rotors. If you notice any of the following symptoms with your brake system, your brakes may need servicing. Just bring your vehicle into Milex for our brake system Performance Check, where we can investigate any underlying issues. Vehicle is pulling to one side while applying the brake. Brake pedal vibrates when applying the brake. Noise or squeaking when applying the brake. Frequent need to add brake fluid to the master cylinder. Road Test vehicle for proper brake operation. Inspect and measure rotors and drums. Hydraulic System for leaks and condition. Remove all wheels and inspect brake linings. Check brake fluid for moisture and contamination. Inspect master cylinder and cap. Inspect calipers and wheel cylinders. Give written estimate for needed repairs. To learn more about our brake services, find your nearest Milex Auto Care today. How can you prevent damage to your brake system? Each component within the brake system needs service at some time. It is likely the brake pads will need replacing when they become too thin. If pads are not replaced and wear away too much they can damage the rotors or drums. Damaged rotors or drums can warp or crack and cause complete brake failure. Keeping up with brake pad maintenance can help keep you safe and prevent more costly repairs. When should you service your brake system? 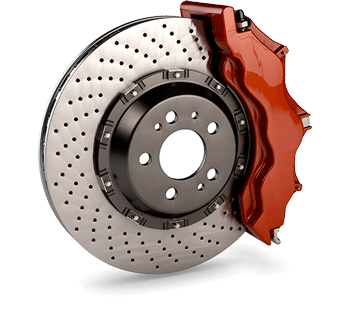 If you notice poor braking performance you should bring your vehicle in for a brake system inspection. Also consult your owner’s manual to find at what mileage the brake system should be serviced. Have your brakes inspected at every oil change. How do you prevent brakes from wearing out quickly? Several factors besides consistent maintenance can affect how long your brakes last. Driving habits, operating conditions, vehicle type and quality of brake lining material can all factor into the longevity of your brakes.